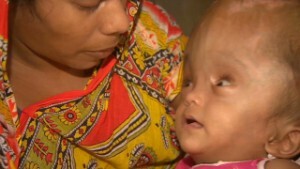 Four months ago, the circumference of Roona Begum's head was 94 centimeters -- almost triple the size of a normal baby -- due to ten liters of excess fluid inside her brain. 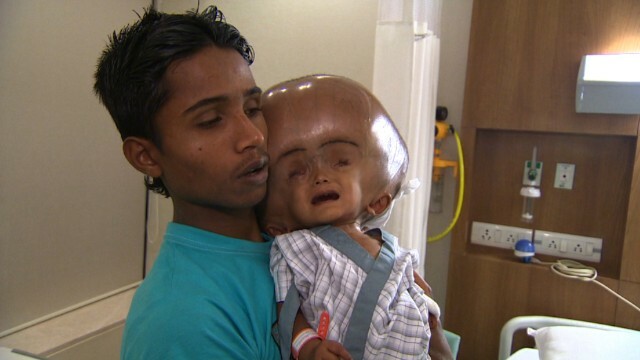 Born in a remote village in northeastern India, Roona was diagnosed with an extreme form of hydrocephalus and was given only a few months to live. 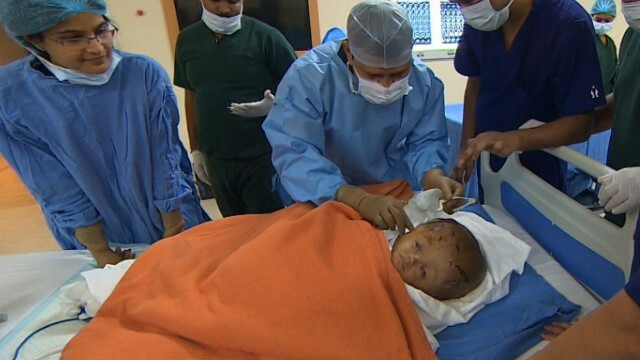 Tripura, India (CNN) -- The pictures may be difficult to look at, but 18-month-old Roona Begum's story of survival is remarkable. 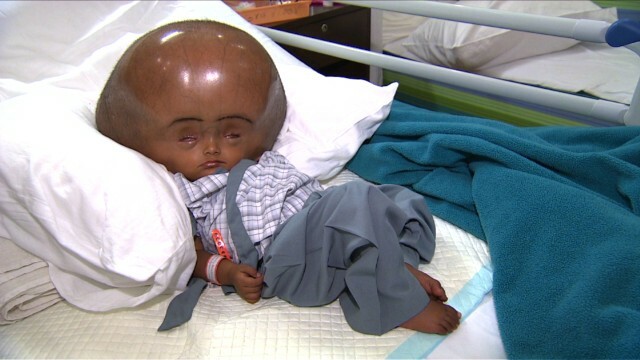 Soon after she was born in a remote village in northeastern India, Roona was diagnosed with an extreme form of hydrocephalus -- a disorder causing cerebral fluid to build up in the brain. Doctors had given Roona just a few months to live. "Day-by-day, her head started growing bigger, she stopped wanting to eat, she would just lie in bed, it became very difficult for us to carry her and take her anywhere," says Roona's father Abdul Rehman says. Roona's head grew to a circumference of 94 centimeters, almost triple the size of a normal baby. There were ten liters of excess fluid inside her brain. Her head was so heavy she could barely move. Hydrocephalus is more common among infants and older adults. The condition is caused by overproduction, obstruction or lack of absorption of the cerebral fluid in the brain. Her head started growing bigger, she stopped wanting to eat, she would just lie in bed, it became very difficult for us to carry her and take her anywhere. The skin of her head has stretched so far, it pulled her eyelids over her eyes, making it impossible for Roona to see. Her mother, Fatima Begum, would draw eyebrows on Roona with black kohl everyday just to try and make her look more normal. "She had such a big head, it was scary for people to see her," Fatima explains. Roona may be Abdul and Fatima's only child, but they couldn't afford to treat her. Roona's 18-year-old father works at a brick kiln earning less than $3 a day. For more than a year and a half, they took care of Roona in their two-room mud hut, with little knowledge or means of doing much else. In April this year, a journalist took photos of Roona and soon people all over the world including two Norwegian students Natalie Krantz and Jonas Borchgrevink were moved by her condition. Krantz and Borchgrevink put Roona's photo on a crowd funding website, hoping to raise $1,600 to cover her shunt surgery. In two months, they raised double that amount, and by August 2013, they raised more than $60,000. They've transferred half of this amount to the charity arm of Fortis Hospital in New Delhi for her treatment. The hospital covered the remaining half of the expenses. The students plan to send the remaining amount for Roona's aftercare. When Roona arrived at Fortis, her condition shocked even chief neurosurgeon Sandeep Vaishya, who has treated hundreds of children with hydrocephalus. "We had never seen anything like that and we were completely clueless as to how we'd go about treating her. There was no precedent of treating a child with such an extreme case of hydrocephalus. We learned as we went," Vaishya says. Initially, Vaishya wasn't hopeful about the surgery. Roona was malnourished, she had major infections on the back of her head from the pressure of lying down all day, and her skin was very thin and delicate. We had never seen anything like that and we were completely clueless as to how we'd go about treating her. Cerebral shunt is the standard treatment for hydrocephalus. It's a simple procedure which involves inserting a drainage tube to keep the fluids flowing at the proper rate. But due to the size of Roona's head and her small, frail body, Roona's treatment was particularly challenging. Vaishya says the surgery posed a huge risk to her life, and at one point they almost lost her. Much to the relief of her parents and her doctors, Roona has pulled through. 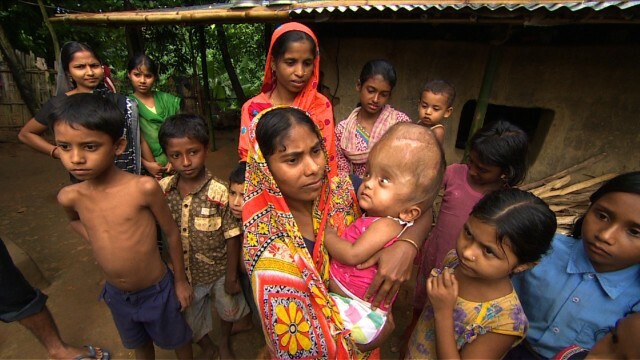 After five surgeries, Roona's head is now down to a circumference of 58 centimeters, still larger than the average 38 to 48 centimeters, but small enough to allow her to live a reasonably normal life. She constantly moves her head around, she is playful and most importantly, she can now see. She is finally getting the chance to be the baby she really is. "It feels really good to see her now, she looks beautiful and happy," Fatima says. Back in her village, Roona has become the center of attention. It's still painful for her to sit up but she smiles a lot, and her eyes, now visible, keep wandering in a frenzied pace. Back in her village, Roona has become the center of attention. Its too early to tell if she will ever be completely normal -- several operations still lie ahead, but the signs so far are promising. "We want Roona to read and write once she grows up. Both of us (mother and father) are illiterate so we don't want her to be like us. We want her to have a bright future," Fatima says. It's too early to tell if Roona will ever be completely normal in her appearance as several operations still lie ahead, but the signs thus far are promising.